Over 100 demonstrations have been planned across the country in favour of better pay, improved purchasing power, retirement protection, gender equality, and a fairer education system. The French communist party also declared it would take part in today's action. "There has been positive feedback. Some of the groups who don't protest readily are joining us this time", Veyrier told Reuters news agency. The FO regrets however, that the biggest union, the CFDT, has decided not to join the strike. Its leader, Laurent Berger told France Culture radio that "we (the union) don't really know what their main motivation is". It's the first interprofessional strike since October 9th and is expected to have a bigger turnout than the previous demonstration organised by the CGT on the 5 February where some 137,200 people turned out according to the Interior Ministry. At that occasion, they were joined by yellow vest protesters, finding common ground on some issues. But despite this, the CGT and the FO chose to boycott the Grand National Debate, organised by President Emmanuel Macron. 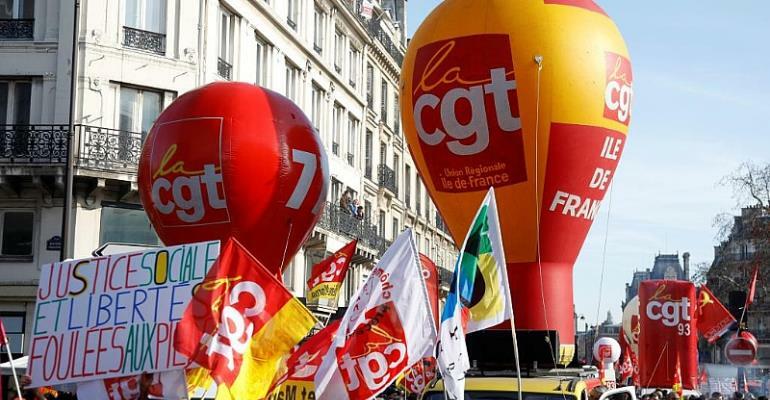 The CGT has said it wants to put the debate "back where it should be", meaning action inside companies as well as in the streets. For Yves Veyrier, interviewed by RFI French service "violence is admitting a weakness. We want to protest calmly." "The trade unions can't sit back silently like spectators, in this current context..."
"It's time to oblige employers to sit down at the table" he insists. "We were hosted by the Elysées (palace) on 10 December...but the answers given did not address the essential issues such as salaries," he concluded.